Do you enjoy travelling? Are you an explorer? Is it your wish to visit all parts of the world without any restrictions whatsoever? If that was a yes, then this post is a must for you. Being a traveller and being self dependent is a wonderful thing ofcourse. But there are so many other responsibilities attached to this. You also have to work and make money to make ends meet. And with the world advancing, expenses are always on an increase. So in a situation like this, you will definitely need a job that will take care of your expenses and let you enjoy as much as you like. 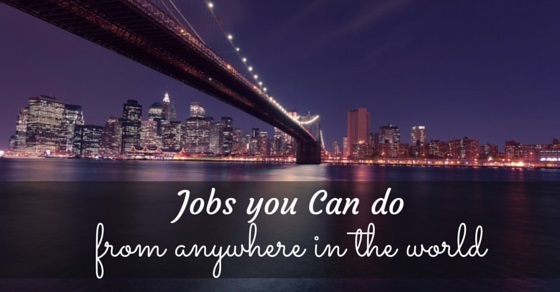 And on that note, let us introduce to you some of the best jobs you can do from anywhere. Do you love taking pictures? Is photography your forte? Are your pictures of great quality? If the answer is a yes, then you can definitely become a photographer. Freelance photographers make a whole lot of money since there are so many agencies that are constantly in search of people who can take brilliant pictures just for them. Initially you will be making less money. But with time that will gradually increase and you will be on top of the list. It might take some time but you can surely work your way up. A second job you could do from anywhere in the world is one of a writer. You can only go for this if your writing is good enough. Plus if you enjoy playing with words, the work of a writer can certainly fetch you a whole lot of money. You will be able to take good care of your finances and run expenses at home too. Plus when you become a writer, you also get more recognition and respect on websites. Yoga instructors have become quite popular in the business these days. The good part is that yoga can be done best when amidst nature which means you spend more time outside than inside. Plus yoga instructors are required everywhere. So you can literally travel all over the world without having to worry about financial security. The payment is also usually good with this one. This job is actually quite ideal for those who aren’t very good at communicating. Yogis tend to speak a language of their own and it can be used anywhere. A fourth option we think you should try is one of a personal trainer or coach. To be very honest, the concept or language of sports doesn’t vary all that much. Americans and British both play the same type of sport. The difference is hardly ever felt. Plus there are hundreds of agencies and sports clubs that need trainers. Even models and celebrities need coaches on a regular basis to train them. So if you like exercising and you think you can handle this, then definitely give it a shot. The world of medicine is vast. And the number of people that need to be treated is always bigger than the number that treats. So if you love science and medicine and would like to travel around the world as you work, you can definitely pick any option that belongs to the medicine background. Some of them include nurses, doctors, vets, dermatologist, skin doctors etc. They are highly respected and are paid well too. The only con could be irregular hours. So if you can deal with that, then nothing like it. Who doesn’t need a good massage these days? Everybody does. So if you think you can become a great masseuse or maybe a physical therapist, this job would be perfect for you. Not only will you be doing what you love but also making some good money out of it. Physical therapists however need some kind of degree before they can get into the business unlike masseuse who can finish it off with a certificate course. Plus if you become a masseuse, you will be getting tips that will take care of extra expenditures. If you are good with languages and can translate or teach well, then you should definitely choose the profession of a translator. These people are always respected in the business and have the opportunity to travel around the world because literally everyone needs them. Plus you will always have the chance to meet more people and hopefully learn more. There are plenty of courses available online. Once you have completed a degree or a course, pick this one right away! You will definitely get hired soon if you are good at it. One of the best job opportunities for those who love travelling around the world is blogging. You can literally blog about whatever you want. There are hundreds of others in the world who have the same interest as you and with your writing; you can actually help a whole lot of other people. However if you want to make some solid money out of it, you have to learn how to blog the right way and get enough traffic. It isnt impossible but it could take some time. A tour guide is certainly what you should become if that is who you want to be. If you like to travel and have excellent communication skills and if you think you can meet and handle people on a regular basis, do try becoming a tour guide. This job is surely going to be super fun as you will be helping people tour beautiful landscapes, shopping arcades, wine bar tours etc. Private touring is also supposed to be super exciting. The best thing about tour guides is that they make good money. There is financial security with this as well. Real estate agent could be a good profession if you are into it. This could be a fine opportunity for you to earn big bucks. All you need is some good understanding and advertising skills. You have to be able to sell houses like a professional. If you are able to do that, then there is absolutely nothing like it. Realtors also do the same job and have enough respect. Plus real estate agents have the chance to travel around the world. They are quite similar to property managers after all. A bartender or server would be a good profession if you like working at bars and pubs. If the party life attracts you or if you are good at making a couple of drinks, then definitely pick this one. You can do this kind of work almost anywhere in the world. Plus you will be getting several other advantages such as a few free drinks, some good tips and also decent money to make a living. Who knew mixing cocktails and creating cool drinks could get you so far in life? If you are a college student and looking for something temporary, try this! So this completes our top list of jobs you can do from anywhere around the world. We do agree that some of them could be limited in terms of salary but if you are willing to do a side job to make both ends meet then there is nothing like it. Plus there are so many opportunities given to you already. And trust us when we say this; you are not the only one. Hundreds of people feel the same like you do. Hopefully it won’t be all that difficult for you to pick. On that note, we wish you good luck and here’s hoping that you find what you have always wanted and be happy with it.